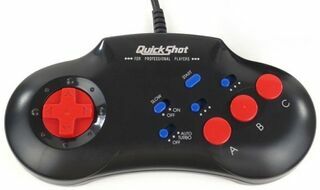 The Invader 3 by QuickShot is a third-party controller for the Sega Mega Drive, sporting three buttons with turbo features. The Invader 3 is one of QuickShot's earliest controllers for the Mega Drive system, being replaced by the Starfighter 3+3 some months later. As with other QuickShot controllers, there are other "Invader" controllers - the Invader 2 for example is for the NES, sharing a similar plastic shell but with differing amounts of buttons (and plug). The Invader 3 design was licensed by several peripheral companies, including Intertronic and TecnoPlus making it difficult to document. It is assumed that given their history and the existence of other variants, QuickShot designed this controller, but this has yet to be fully confirmed. Furthermore it is unknown which regions the Invader 3 was officially sold in.